Shouldn’t every kid know how to throw a football? Toss a frisbee? Swing a golf club? Or hit a tennis ball? So far, we are three out of four, so not bad. Our boys don’t necessarily have to play competitive team sports as they have found their niche in the pool, but having these basic skills are must haves in life, right? Our whole family enjoys flinging a frisbee and playing catch with the football at the park or the beach. We keep them both close at hand, especially in the summer months. Check out Pocket Disc, our favorite 100% cotton throwing discs. You will never go back to the old fashion plastic ones, promise! As for the more technical sports, I leave it to the more experienced. My Dad, a lifelong golfer, loves taking his grandkids to the driving range. He is proud to report that both boys have a pretty good swing, but they are still too young to take to his course. And golf takes more planning and preparation as the game is not easily transportable. Up until now. 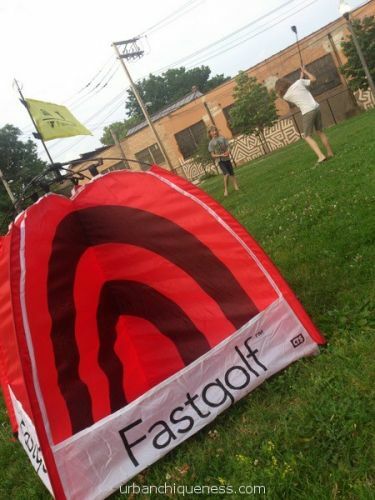 Our new friend and neighbor owns Fastgolf. 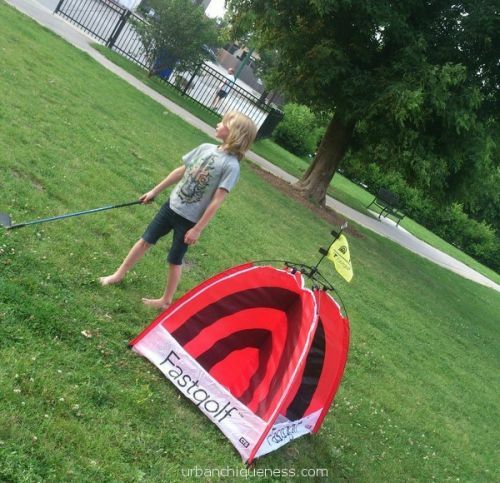 It is an amazing portable golf game that allows you to set up and play a mini course anywhere, anytime! He was kind enough to give us a starter set. We absolutely love it. It comes in a great carrying case and includes a target, tees, large plastic golf balls and oversized polymer 7 irons. Simply genius! PJ was so proud as he scored a hole in one, first try, first shot! 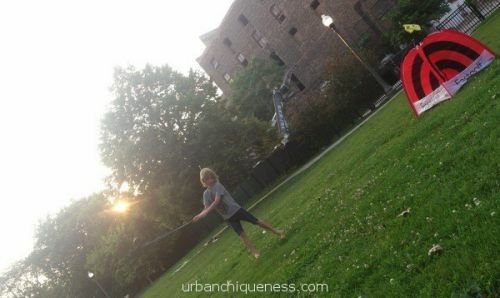 We set it up in the park so the boys could drive the ball a little further, but it truly works in any open space. It even comes with a mini scorepad. 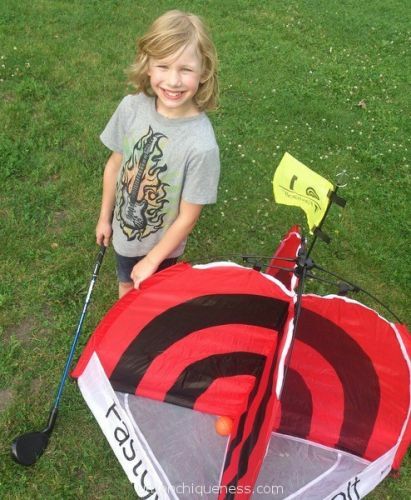 Great for kids, adults and even scratch golfers. It takes our “Chique” summer picnic pack to a whole new level, my friends. Check it out here and let me know what you think! Great post! The boys certainly had fun, and its was a great way for them to hone their skills, and build confidence.